Starting Saturday afternoon, September 12, Thaivisa.com has received numerous reports from forum members indicating that immigration checkpoints on the Thai-Cambodian border were “no longer stamping visa exempt entries”. The checkpoint in Kanchanaburi on the Thai-Myanmar border was reportedly also closed for “border runners” holding a valid tourist or Non-Immigrant visa. According to numerous member reports on the Thaivisa forum, border checkpoints at the Cambodian border are “effectively closed for people wishing to complete an out/in border run”, i.e. foreigners who cannot produce a regular visa but wish to re-enter Thailand under the visa exemption scheme are effectively banned from crossing the border to Cambodia (obviously unless they wish to stay there). As it seems, foreigners holding a regular double- or multiple-entry tourist or Non-Immigrant visa are not affected at most border checkpoints; however, at least two immigration checkpoints along the Thai-Cambodian border as well as the checkpoint at the Thai-Myanmar border in Kanchanaburi would reportedly not stamp anyone in/out on Sunday, including foreigners holding a valid visa. See this thread at Thaivisa.com for the most current updates and member reports. While this is most likely only a temporary procedure related to the bomb attacks in Bangkok last month (it was reported that one suspect had bribed his way through the Thai-Cambodian border using a fake passport), at least one member post suggests that immigration have actually only started enforcing last year’s “new” visa run rules. The official “new” regulations that made big headlines in mid-2014 but were not immediately enforced appeared to affect only foreigners wishing to enter Thailand on visa exempt entries (15 or 30 day stamps) without a valid visa. Holders of valid tourist or other long-stay visa were not to be affected. Please scroll down for the most recent updates on the current “border run crackdown” situation. We’ll write a more comprehensive post on the “new rules” as soon as there is reliable official information available from the immigration bureau and the “new rules” aren’t just arbitrarily enforced, depending on which immigration checkpoint you visit. UPDATE (September 14) – According to a report by AEC News Today (see the update at the bottom of the page) and a member post on the Thaivisa forum today, the most recent crackdown on border runners will affect only tourists without a visa that have stayed in Thailand for 90 days or more under the visa exemption scheme. Tourist visa holders seeking to activate a second entry as well as foreigners holding multiple-entry Non-Immigrant visa will not be affected. People from eligible countries will be provided with 15- or 30-day visa exempt entries (depending on eligibility) enabling a maximum stay of no more than 90 days in one calendar year. Any time spent in Thailand on a tourist visa will not count towards the 90-day limit. People with multiple entry visas can also once again exit and reenter (out-in/ exit-entrance) Thailand to activate the second or subsequent allowable entries. The instructions for this most recent crackdown on border runners were reportedly issued late Friday night from “someone high up in the immigration department”, obviously in response to criticism of the immigration bureau by the national police chief. While the situation at previously affected border crossings is expected to return to “normal” soon, “normal” quite apparently isn’t just a return to immigration procedures as they were handled until the end of last week. At least the rules for foreigners seeking to enter Thailand without a valid visa have changed rather dramatically, at least for the time being. So what exactly are the assumed new “rules”? As previously, foreign tourists from eligible countries do not need a visa to visit Thailand but can do so under the visa exemption scheme. However, for the time being, they may stay in the kingdom for no longer than a total of 90 days “in one calendar year” (so not only consecutive visa-exempt stays in the kingdom count). If you wish to stay in Thailand for longer than 90 days per calendar year you’re urgently advised to apply for a proper tourist visa or Non-Immigrant visa of an appropriate kind at a Thai embassy or consulate outside the country, for example, in Vientiane or Savannakhet in Laos. Holders of valid multiple-entry tourist visa seeking to activate a second or third entry at a border crossing as well as holders of multiple-entry Non-Immigrant visa are not affected by the recent crackdown (which in fact is a crackdown on “border runners”, not “visa runners”) and no 90-day limit applies. Note: This is our interpretation of the new border run rules and nothing official yet. UPDATE (September 15) – Thaivisa.com also has an important update on the “visa run crackdown” situation which makes no mention of a 90-day limit for visa-exempt stays in the country but categorically states that “border runs” for tourists who don’t hold a valid visa are now completely banned. renewals of 15/30 day visa exempt entries are not allowed. Foreigners entering Thailand [we assume that includes those holding a valid visa?] can also be expected to provide information on where they will be staying in the Kingdom, as well as items such as a valid travel itinerary, if requested to do so by Immigration officials. So unless you’re holding a valid double-entry tourist visa and want to activate your second entry, or you’re holding a multiple-entry Non-Immigrant visa, it looks like out/in border runs are completely prohibited for the time being. If you’re in Thailand on a 30-day visa-exempt entry stamp now you CANNOT just go on a one-day “border run” to Cambodia, stamp out and stamp back in. Instead you will have to visit a Thai consulate abroad, e.g., in Vientiane or Savannakhet in Laos, and apply for a proper visa. Alternatively, if you stay in Cambodia for a month or two, we assume you should be able to get back into Thailand again across a land border and without a visa – or not? They mean foreigners who do not hold a valid visa but try to re-enter Thailand under the visa exemption scheme. So perhaps even if you’re holding a valid tourist or other visa, immigration officials at the border may ask you to produce an online air ticket, proof of hotel booking or other stuff? We understand these have always been official (yet never enforced) requirements for obtaining a tourist visa in the first place but may still make things a bit messy for those who pretty much “live” in Thailand on the basis of back-to-back tourist visas. All immigration checkpoints along the Thai-Cambodian border are refusing foreigners of any nationality to complete an out/in border run unless they can produce a valid tourist or other visa. Immigration officials at the Phu Nam Ron checkpoint along the Thai-Myanmar border in Kanchanaburi are reportedly refusing to stamp anyone out/in, including those holding a valid tourist visa. It’s reportedly “business as usual” along the Thai-Lao border. As it seems, no problems have been reported yet either at any other land border crossings. UPDATE (September 17) – Tough news tonight. Based on information from a Bangkok-based visa service provider, Thaivisa.com reports now that several immigration checkpoints along the Thai-Cambodian border, as of Friday, September 18, may no longer issue out/in stamps to any foreigner, regardless of whether you have a valid (tourist or other) visa and simply want to activate another entry, or not. 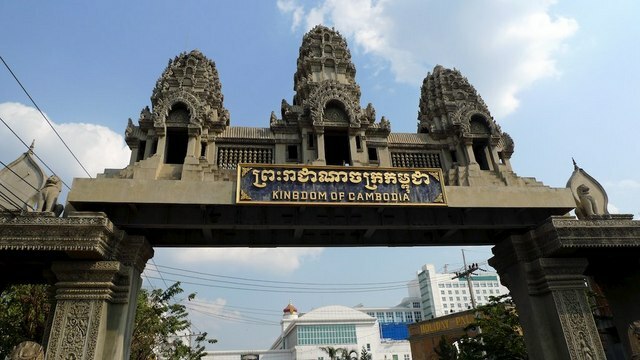 At least three border crossings with Cambodia will reportedly also stop tourist visa holders from completing out/in border runs – Ban Laem and Ban Pakard in Chantaburi province (popular with visa run agencies in Pattaya), and Aranyaprathet/Poipet which is the favourite destination for visa runners from Bangkok. Immigration officials at the Phu Nam Ron checkpoint on the Thai-Myanmar border in Kanchanaburi have taken the same stance and rejected also tourist visa holders since the latest crackdown began over the weekend. It remains unclear whether this is only a temporary measure and the situation will return to “normal” (what is “normal”?) anytime soon, or whether this is a longer-lasting “purge”? Please also note that this is merely based on information from one visa service provider and has not been confirmed yet. The “good” news, relatively speaking, are that border runs are reportedly still possible as previously at the Surin and Sisaket immigration checkpoints on the Thai-Cambodian border in Isaan. No problems have been reported either at the Ranong checkpoint at the Thai-Myanmar border. All immigration checkpoints along the Thai-Lao and the Thai-Malaysian border also issue out/in stamps as previously. If you really need to do an out/in border run, say, you’ve got a double entry tourist visa and have to leave/re-enter the country to activate your second entry, you’re advised to visit either a border checkpoint along the borders with Laos and Malaysia, the border checkpoints in Surin or Sisaket (Cambodian border), or Ranong. Another alternative would be to fly out of Thailand (to a nearby destination) and return to the kingdom by air. No problems have been reported yet re: out/in visa runs by air and arrivals at international airports. UPDATE (September 18) – Thaivisa.com have a roundup of border run alternatives and how to get to the respective border crossings. If you stay in Pattaya or Bangkok and need to go on an out/in border run, the listed immigration checkpoints are all considerably further away than the ones usually used by local visa run agencies, so unless you take a flight but travel by bus or train you should be prepared for a two-day trip at least. UPDATE (September 22) – Regarding a previous report that immigration officials at the four most popular land border checkpoints near Bangkok and Pattaya had stopped issuing out/in entry stamps even to holders of valid tourist or non-immigrant visa some days ago, there are now obviously some good news. allow out/in stamps for “Westerners/Japanese/Russians” in possession of a valid double/triple [entry] tourist visa or multiple [entry] non-immigrant visa. Visitors from ASEAN countries, including tourists with a valid visa, will however continue to be rejected at the border. As previously, visitors of any nationality without a valid visa who wish to enter Thailand under the visa exemption scheme will not be allowed either to complete an out/in border run. UPDATE (September 24) – The “crackdown” situation has further relaxed and visa holders of all nationalities are now once again allowed to complete out/in border runs at all immigration checkpoints on the Thai-Cambodian border. So if you have a valid double- or triple-entry tourist or multiple-entry non-immigrant visa and seek to activate another entry you will have no problems whatsoever at any Thai-Cambodian land border crossing. Tourists on 15/30-day visa-exempt entries that do not hold a valid visa are however still not allowed to complete out/in border runs at the aforementioned checkpoints. UPDATE (September 27) – According to a post on Thaivisa.com, the immigration checkpoint in Kanchanaburi province on the Thai-Myanmar border is also open again for tourists holding a valid visa; still no out/in border runs though for visitors on 15/30-day visa-exempt entries. UPDATE (October 7) – More good news it seems. It appears like the visa run crackdown situation has returned to “normal” again at least at the Ban Laem checkpoint on the Thai-Cambodian border in Chantaburi, a popular destination for daily visa run tour groups from Bangkok and Pattaya. (…) 15/30 day visa exempt possible again, restriction: Thai Immigration will allow a total of 90 days under visa exempt per calendar year. Valid for ASEAN, Westerners, Russian and Japanese. Time spend under Tourist Visa or Non Immigrant or extensions are not counted towards that 90 day allowance. Out/in border runs are reportedly also possible again at the Ban Pakard/Prum checkpoint, also in Chantaburi province, and at the Aranyaprathet/Poipet border crossing, i.e. provided you haven’t exceeded a limit of 90 days on visa exempt entries in a calendar year. In other words, checkpoints on the Thai-Cambodian border are open again for out/in border runs as long as you stick to the (yet unofficial) “90-day rule” which currently seems to apply to the “four southern crossings to Cambodia and the Kanchanaburi crossing” only. This would be in line with an earlier AEC News Today report (see our update from September 14) that suggested that the most recent crackdown affected only tourists without a visa that have stayed in Thailand for a total of 90 days in a calendar year and wish to re-enter Thailand on another visa-exempt entry. As previously, foreign tourists from eligible countries do not need a visa to visit Thailand but can do so under the visa exemption scheme. Back-to-back 15/30 day visa-exempt entries at land border checkpoints will also be allowed. Foreign visitors may however not stay in the kingdom on visa-exempt entries, i.e. without a valid visa, for longer than a total of 90 days per calendar year. Once you’ve stayed in Thailand on visa-exempt entries for a total of 90 days in one calendar year and cannot produce a valid visa, you may get rejected at the border. Provided applicants fulfill the requirements (this includes an outbound air ticket), visitors from most Western countries can extend their 15/30-day visa-exempt entries for another 30 days at their local immigration office. Please note that this new 90-day-per-calendar-year rule currently only appears to apply to the border checkpoints near Bangkok and Pattaya and has NOT been officially confirmed. It is NOT being enforced at other land border checkpoints either where there continues to be no official limit to the number of border runs you can do. In addition, there are also reports that the (unofficial) limit for out/in border runs may be six visa-exempt entries, not 90 days per calendar year. UPDATE (November 16) – In case you’re staying in the North of Thailand – as made clear in this thread on the Thaivisa expat forum, out/in border runs currently seem to be a no-no at the Thai-Myanmar border crossing in Mae Sai (Chiang Rai province). No problems as it seems though at the Chiang Khong immigration checkpoint on the Thai-Lao border, also in Chiang Rai. The Kanchanaburi checkpoint on the Thai-Myanmar border does still not allow out/in border runs either unless you have a valid visa for re-entry. UPDATE (February 2016) – As it seems, there is still no standard procedure valid for all Thai border crossings. Regarding the number of 15/30-day visa-exempt entries that will be granted at immigration checkpoints along the Thai-Cambodian border near Pattaya, it appears that either a limit of 90 days per calendar year or an opaque alert system applies, where immigration get an alert after some six visa-exempt entries. It remains unclear whether this alert system applies to back-to-back visits, visa-exempt entries per calendar year or per passport? Visa exempt, 15/30 day stamp, Thai Immigration Ban Laem [so this doesn’t necessarily but may well apply to other checkpoints at the Thai-Cambodian border] give 3 visa exempt stamp per calendar year. After that you go to a Thai Embassy to apply for SETV [single-entry tourist visa] or Non Immigrant Visa. So the current (!) rule of thumb seems to be that three back-to-back visa-exempt entries – which can be extended locally for an extra 30 days each – are definitely okay. After that, if you wish to stay in Thailand longer and be on the safe side, it might be wiser to apply for a regular tourist visa, for example, in Vientiane. Having said that, there is still no generally accepted rule and this is just our personal interpretation and advise. There is no official limit either on the number of visa-exempt entries you can do in six months as often suggested by “those in the know” (sic). As noted above, we’ll write a more detailed update on the current “visa run crackdown” situation or a summary of the “new rules” as soon as there is reliable official information available from the immigration bureau (we mean not just unnamed “sources”) or a standard procedure at all border checkpoints. When you refer to 15/30 day visa exempt, does that mean that the land crossing is issuing only 15 day visa on arrival extendable by 30 days? Or can I get a 30 day visa on arrival extendable for 30 day? It depends on where you come from. If you’re from a G7 member country (USA, Canada, UK, Germany, France, Italy, Japan) you get a 30-day entry stamp at the border, otherwise only 15 days. These 30 or 15 days can be extended at a local immigration office for an additional 30 days. what about countries with bilateral agreements that get 90 day visa excempts (such as Chile, Peru). Can they do 3 back to back visa runs in a row at Ban laem? Sorry but I’m not familiar with the border run rules for APEC member countries. I would guess though that they’re a bit more relaxed?